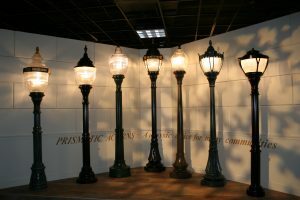 Sternberg Lighting has been creating lighting fixtures and ornamental poles since 1923. Today, their product has expanded to include custom projects and site amenities, such as clocks, street signs, mail boxes, benches and trash receptacles. Previously a liquid operation, Sternberg made the transition to powder in 2005. As a custom shop, they will apply any color the customer wants. Making quick color change an important consideration. More importantly, the reliability and application efficiency of the powder guns was a primary concern. Finishing Department Supervisor, George Howe, has worked with numerous application equipment vendors over his career and concluded that Gema USA would make the best fit for Sternberg. “Some of the other equipment guys make a pretty good booth,” George admitted, “but Gema definitely makes the best guns! 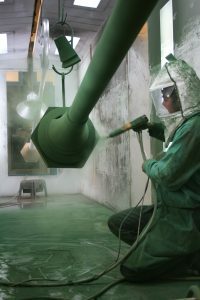 Sternberg installed a Diamond™ 10,000 cfm powder booth with automatic gun triggering. The booth was fitted with OptiGun™ automatic powder guns, OptiTronic™ control units, and OptiFlow™ high-performance powder pumps. EasySystem™ touch-up units were attached to the booth to accommodate areas where manual work is required.